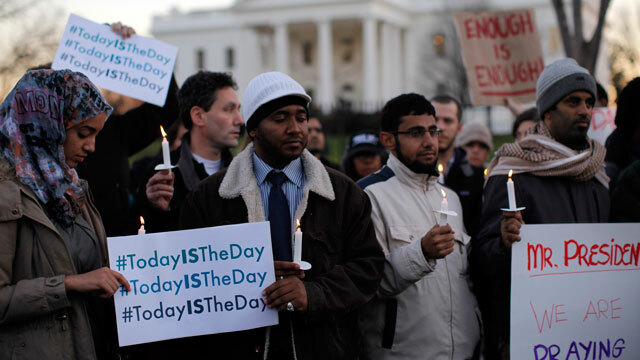 Supporters of gun control gather on Pennsylvania Avenue in front of the White House in Washington, Friday, Dec. 14, 2012, during a vigil for the victims of the shooting at Sandy Hook Elementary School in Newtown, Ct., and to call on President Obama to pass strong gun control laws. The gunman who shot and killed 20 children and six adults at Sandy Hook Elementary School in Newtown carried three weapons on him. Among them was a Bushmaster .223-caliber, a high-powered rifle that he used to repeatedly shoot the children and staff, some at close range. The gun is popular with law enforcement and those in the military. It was also the type of weapon used in the 2002 Washington, D.C. sniper shootings. The other two weapons were a Glock 10 mm and a Sig Sauer 9 mm, which is generally used for elite military purposes and by police units. According to ABC News, the gunman committed suicide with a handgun, and had multiple high-capacity magazines with him. The gunman's mother reportedly had five weapons registered to her, including at least three of the weapons found at the scene. As the nation reels from the shooting, politicians and organizations have called out for gun control. As President Barack Obama pointed out during a service for the Sandy Hook shooting victims on Sunday night, he has attended four such memorials in his four years in office. Yet, gun control laws remain about the same. If anything, they've become less restrictive at the state level. As The New York Times noted, Michigan lawmakers passed a bill on Thursday allowing people to carry concealed weapons in schools, and Ohio lawmakers passed a bill allowing guns in cars at the Statehouse garage. The relationship between Americans and their guns appears to have grown tighter. According to a 2011 Gallup poll, 47 percent of American adults report that they have a gun in their home or somewhere on their property. And according to Gallup, only 26 percent of Americans favor a ban on the possession of handguns by citizens. When Gallup surveyed Americans in 1959, 60 percent favored a handgun ban. On Black Friday of this year, the Federal Bureau of Investigation reported a record number of requests for background checks for gun buyers. Since the FBI does not track the actual number of firearms purchased, that number may be even higher than the background check requests. Mass shootings can actually trigger an increase in gun sales as people worry about self-defense and the possibility of tighter gun restrictions. According to the Christian Science Monitor, gun sales in Aurora, Colorado increased by more than 40 percent following the movie theater shooting there. The National Rifle Association has one of the most powerful lobbying presences in Washington, D.C.
As veteran CBS Washington correspondent Bob Schieffer said, "Congress is literally afraid to take on the National Rifle Association because they know that if they make any kind of statement [that] even suggests some sort of limits on gun control, the NRA is going to pour, literally, hundreds of thousands of dollars in a campaign to defeat them." That is undeniable. According to Open Secrets, the NRA accounts for about 60 percent of what gun rights interest groups spent on lobbying in 2011 and the first part of 2012. The NRA has also spent more than ten times what all gun control interest groups have spent combined in 2011 and the first part of 2012. Gun rights groups also contributed $3 million to political candidates, 96 percent of them Republicans, between January and October 2012. Gun control groups contributed just $4,000 to Democrats for the same period. A portion of that went to Senator-elect Tim Kaine (D-Virginia). The NRA spent more than $500,000 on opposing Kaine's election. According to the NRA's website, "While widely recognized today as a major political force and as America's foremost defender of Second Amendment rights, the NRA has, since its inception, been the premier firearms education organization in the world." The NRA did not respond to multiple requests for comment. Federal gun legislation has changed little in the past decade. A national ban on assault weapons that took effect in 1994 expired in 2004. It prohibited the possession and furthering manufacturing of semiautomatic assault weapons capable of holding more than ten rounds of ammunition. Only a handful of other federal regulations are in place. The National Firearms Act, passed in 1934, requires gun distributors to register guns with the attorney general and note gun sales information. The Gun Control Act of 1968 requires gun manufacturers and salespeople to be federally licensed, and prohibits the interstate sale of guns. The 1993 Brady Handgun Prevention Act mandated background checks for those purchasing firearms, and listed several groups that could not purchase firearms, including those who have been committed to a mental institution and those who were sentenced to prison for more than one year. Federal gun laws trump state gun laws. Still, state laws add a layer to an already complex issue. Gun laws vary from state to state, and many state laws have gotten less tough in recent years. As The Washington Post pointed out in a roundup of the six "craziest state gun laws," Vermont allows 16-year-olds to carry a concealed weapon without obtaining a permit or parental permission. Kansas passed a law in 2010 allowing the concealed carry of guns in elementary schools. Michigan also just passed a bill allowing the carriage of concealed weapons in schools and even churches, but Republican Governor Rick Snyder has not signed it into law and it is unclear if he will in light of the recent Newtown shootings. As The Washington Post also noted, the federal government pushed back at the Kansas law allowing for the concealed carry of guns in schools, saying the law violated the federal Gun-Free School Zones Act. But a court ruled that act unconstitutional, saying it exceeded the federal government's powers under the Commerce Clause. The Clause states that guns "involved in interstate commerce," can be regulated, meaning they cannot be brought into specific school zones. But in this case, the court ruled that the Commerce Clause did not apply. The Brady Campaign ranked Connecticut as having the fifth toughest gun laws in the nation in 2011. To purchase a gun, Connecticut residents must apply for a local permit, and submit to fingerprinting and background checks. The state also has a ban on some assault weapons, although that ban does not cover the Bushmaster used in the shooting. According to the Brady Campaign rankings, California has the nation's toughest gun laws. +Are Mass Shootings on the Rise?